Killing Eve ended in a glorious, bloody fashion, consistent with how the show has been throughout the past eight episodes. There was, of course, the inevitable showdown between Eve and Villanelle but it played out in ways I never expected. That has been the hallmark of the show all season, how it uses familiar spy and thriller tropes and yet manages to put a fresh spin on them despite everything. That is what makes Killing Eve stand out in the genre. And that’s without even mentioning how this show is female-driven and populated with interesting female characters – well-rounded, fully fleshed out, flawed, fascinating female characters. We are already familiar with Eve and Villanelle as well as Carolyn. Anna proved to be more than what she seemed when we first met her, having had some real relationship with Villanelle despite the latter’s crimes. But the best addition to the cast this week was Konstantin’s daughter, Irina, who proved to be a match for Villanelle in more ways than one. It was refreshing to see a “kidnap” situation played out with such dark comedy. Irina is unlike any child character on television, not afraid to pester her captor and to yell at her to get food. “She’s so annoying,” Konstantin describes her with both affection and amusement. And we know what he means. But her dynamic with Villanelle is such fun to watch. Villanelle even seems to like her, or at least forms a grudging respect for the girl. Despite Sandra Oh’s amazing performance and Eve’s conviction and cleverness, I still think I found rather watch an entire series of Irina and Villanelle bickering about languages (I just love the multilingualism of Killing Eve) and scamming oblivious, rich women. But the partnership probably will never happen, given how Villanelle shot Konstantin and fulfilled her mission. Despite Carolyn’s comment, I’m not entirely convinced that Konstantin is dead though. It’s too suspicious for a character so significant to simply die off-screen. In fact, I am pretty convinced that that this will not be the last we see of Konstantin. On another note, we still don’t know much about the mysterious Carolyn and I am so up for that. She is even impressed by Eve’s betrayal and appears not be affected at all. And she has committed to wearing that fantastic fur hat. I look forward to learning more about her in the second season of Killing Eve. The finale really was all about Villanelle’s major relationships. There’s the complex familial relationship she shares with Konstantin, which still didn’t prevent f her from shooting him. At least he got some awkward scenes with Eve first. Then, she passed by the flat of her first “Eve,” Anna of the dark, curly hair. There’s some real history between them and you can feel it despite the short screen time they share with each other. And they definitely slept with each other, however much denial Anna wants to deny it. 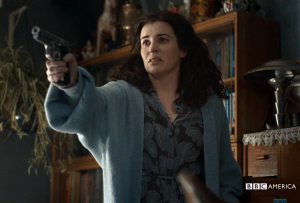 In the end, despite any lingering feelings or attraction, Anna attempts to shoot Villanelle but ends up shooting herself in the head instead. This is soon mirrored by Eve when she finds the assassin’s chic Paris apartment and trashes it relentlessly. She finally caught the person she has been obsessing over and she isn’t sure how she feels about it. Villanelle continues to provoke emotions she doesn’t understand. They meet, and like all their interactions during the season, it’s a fascinating and unpredictable scene. They admit their mutual obsession with each other (Villanelle revealing too much, as usual). And there’s a moment of real connection. They both lie back in bed together for a rare, quiet moment and you almost think: are they really going to do it? Are they going to team up to take down the Twelve while in some forbidden passionate relationship? And the weird part is, almost immediately Eve regrets what she did and tries to help save Villanelle. But too little, too late. She turns around and the assassin has made her exit and that’s all we are left with until Killing Eve returns. Talk about complicated. 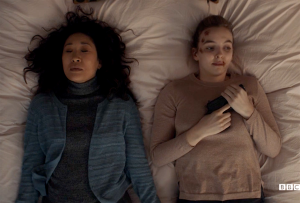 But Killing Eve has been a thrilling ride from start to finish, earning all of its critical acclaim, thanks to the wonderful performances by the cast and the smart, funny, sharp writing of Phoebe Waller-Bridge. She’s given a gift to the crime genre and I can’t wait to see how this story continues.